Technology Holdings is pleased to announce the strategic sale of our client, cDecisions, to PwC. cDecisions is a Salesforce Gold Consulting Partner and a leading provider of Salesforce cloud services in the UK with a focus on financial services and insurance. PwC is one of the largest Big Four professional services networks in the world with revenues of $38B and a focus on audit and assurance, tax and consulting services. Technology Holdings was the exclusive advisor to cDecisions on the transaction. cDecisions is a pureplay Salesforce cloud services provider with a focus on financial services and insurance. cDecisions has built an innovative combination of tools and accelerators on the Salesforce platform to streamline Salesforce implementation and improve business results. cDecisions specializes in delivering bespoke CRM implementation services to a number of major national and multinational companies looking to grow their use of CRM. 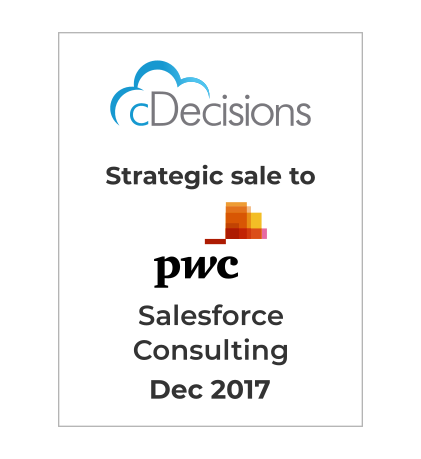 PwC, one of the largest consultancies in the world gains further ground in the rapidly growing Salesforce space with the acquisition of cDecisions. cDecisions’ vertical focus and industry leading capabilities will help PwC transform its clients’ business and customer experience with innovative technologies.